While on our honeymoon in South Africa we went to visit the Cape of Good Hope, the most south-westerly point on the continent. In many ways it reminded me of the wilds of South West Ireland – parts of west Cork & Kerry look quite similar. With the glaring exception of the baboons, that is. We came back from our walk to find this guy resting on a car, taking in the view. 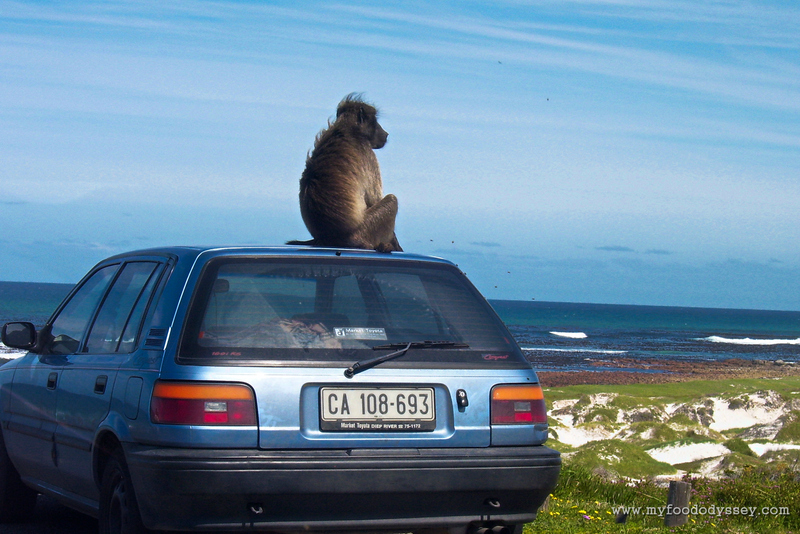 Baboons can be quite vicious – I’m glad it wasn’t our car! Saw the baboons too, hysterical. I have a great shot of one eating a daisy. Love yours!! Thanks, Tina. They were very entertaining to watch – from a distance! great photo! Really want to go to Africa. Thanks Kate. I know it’s a bit of a hike to southern Africa but I really do recommend it. We went to South Africa and Zambia and loved both. Whoa…what is the car’s owner supposed to do when they find this?? Great photo, and looks like a very pretty area. I think you’d just have to settle back and wait for him to get bored and move off. At least there’s a nice view to take in while you’re waiting!